Amazon’s purchase of grocery chain Whole Foods threatens a ripple effect in a variety of associated industries. Aside from the standard delivery of online groceries, which Amazon has been trying to break in to for a number of years, the meal-kit industry is also set to both consolidate and reconfigure as a result. Blue Apron’s IPO was certainly a case of bad timing, coming just a few days after the industry-shaking news of Amazon buying Whole Foods. Blue Apron stock, well anticipated for a long time until Amazon’s announcement, was devalued the day before the IPO from the $15-17 range to $10-11. The lower price still raised $300 million on a company valuation in the region of $2 billion. Some analysts question even that price for a company that has never posted a profitable quarter. 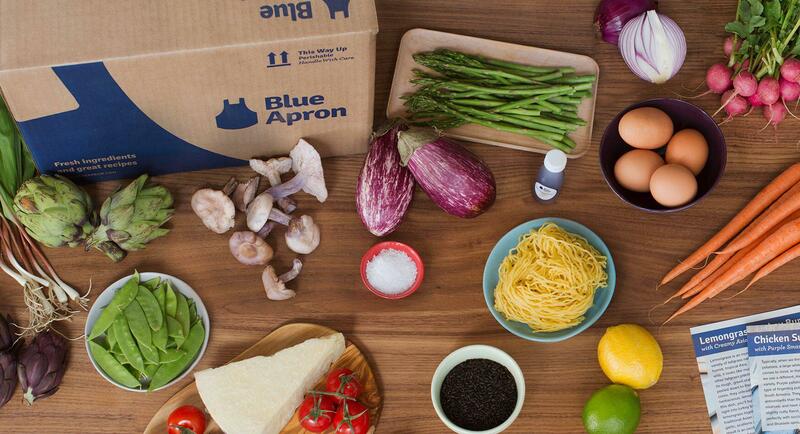 Blue Apron, which was founded in 2012, bases its business model on providing its customers with specialty ingredients to cook meals at home, while at the same time cutting out the expensive middlemen. The company offers both two-person and family delivery meal plans. While the company’s customer base now tops one million, with more than eight million meals shipped monthly, essentially tripling since 2015, revenue growth has risen to $795.4 million in 2016 from $77.8 million in 2014. However, losses in the last three years have risen in unison with revenues and in 2016 totaled $54.9 million, mostly as a result of marketing expenses. Third-party on-demand food delivery can take the form of companies that produce food that is delivered by others, companies that partner with restaurants to deliver their menu meals, and then companies like Blue Apron that produce the ingredients that a customer needs to make a recipe at home and deliver it direct to the consumer. But the market for on-demand food delivery is ultra-competitive, with companies – such as SpoonRocket, Maple and Sprig - folding under market pressure all the time. Companies with varying degrees of success – such as DoorDash, MunchOnMe, Postmates, SnapFinger and Munchery - crowd all areas of the market leaving little room for error. The tepid response to Blue Apron’s IPO share price is seen by many analysts as much an apprehension about the company’s long-term survivability potential as it is a reaction to the Amazon/Whole Foods industry game changer. That said, Whole Foods already sells meal-kits that combine their signature fresh foods and brand name for a loyal customer base, while Amazon’s delivery infrastructure is second to none. The resulting Amazon/Whole Foods synergy would also result in competitive price cuts and even more efficient and faster delivery and pickup services because Whole Foods store locations would put Amazon’s customers even closer to their grocery distribution outlets. Things won’t get any easier for the industry once Amazon completes the acquisition of Whole Foods, and that concern may well have been reflected in Blue Apron’s IPO stock price. The bottom line is that, as consumer demands move ever-closer to “immediate” and “same-day,” if any company’s infrastructure is not already set up for such expedited delivery, or it costs too much to accomplish it, the future can look bleak.